The last time the market was moving off a similar overbought condition was January 7th and that day’s bar was very similar to similar to Thursday’s. 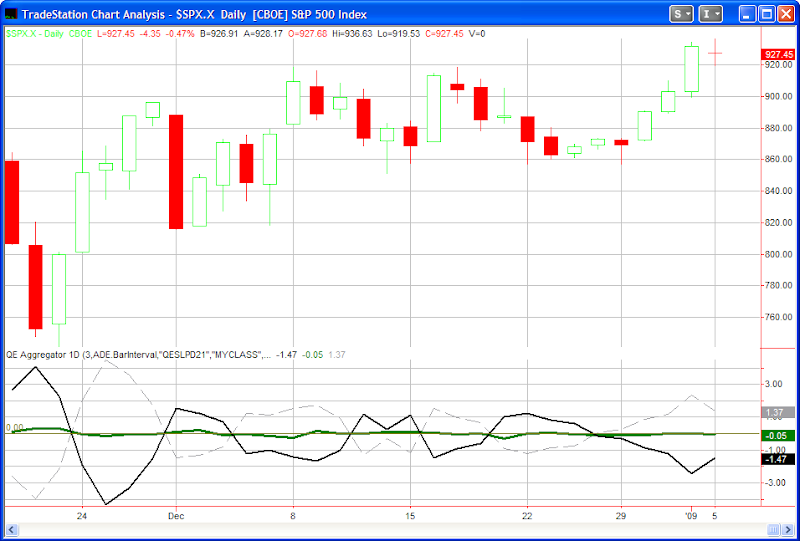 It included an unfilled gap down from an overbought condition and a selloff of close to 3%. Below is a study that appeared in the January 8th Subscriber Letter that looked at similar situations. Note the study does not include the January 7th instance which led to further selling. I also found when doing this study that the stronger selloffs led to stronger further declines on average. The S&P is gapping lower by more than 2% this morning. I've studied this in the past. Click here to read that blog entry. Blog readers should also be aware that the blog is searchable. If you see the market is gapping down a lot then you could just type "2% gaps" into the search bar at the top and several studies related to large gaps would apppear. Edit: Today's gap while over 2% in the futures was "only" 1.8% in the SPY. Therefore is would have missed qualification for the particular study that was referenced. Many traders have heard the term “Turnaround Tuesday”. And with the market a bit short-term oversold after the selloff the last few days many traders are also hoping we see a Turnaround Tuesday. But are they just a myth? I recently put them to the test. First I looked at performance if the market closed lower 1 day. In the table below I show all the days of the week. The day listed is the trigger day – not the performance day. In other words, if Monday was the 1st down day then the S&P would be bought at the close and sold at Tuesday’s close. So the Monday trigger tracks Tuesday’s performance. Tuesday’s trigger tracks Wednesday’s performance…and so on. Here we see going back to 1960 that Tuesday had the only positive results of the week. What if the market was down 2 days (as it is now) instead of just one? Tuesday is again positive, but in this case Thursday has actually performed a little better. How about 3 days in a row? Here again Tuesday is the star of the week. In all cases Tuesday shows by far the best potential for a turnaround. The results are even better recently than if you look back 58 years. It appears Turnaround Tuesdays are real…and they’re not just for old folks. I’m a little under the weather today, so rather than producing research myself, I’ve decided to add a few links to the blogroll and point out some recent articles I found interesting. From Active Trader Mag I recently came across this interesting article which places bands around RSI levels rather than looking at absolute levels. Market Rewind with tests of consistently oversold and overbought RSI readings. Incidentally, one feature of the new Market Rewind ETF tools shows 5-day historical short-term RSI’s on a massive number of sortable ETF’s. I’ve beta-tested the tool. ETF traders should definitely check it out when it goes live. Can’t get enough RSI talk? Check out MarketSci and Woodshedder. For those looking to improve their intraday trading, it’s not uncommon that Traderfeed comes up with a gem like this one last week. Behind the Headlines – Barrons columnist Michael Kahn offers more insights on his blog. Skill Analytics – Would’ve thrown this one up there a while ago but he just didn’t post that often. Postings have picked up recently and he now provides a nice ETF correlation tool as well. The Deipnosophist – Smart reading about the market. I’ll save further additions for another sick day. The number of new 52-week highs on NYSE came in lower on Friday than it did Wednesday. It’s fairly unusual for the S&P 500 to make a significantly higher high than the day before and see the total number of new 52-week highs contract. Friday’s high was over 3% above the previous day’s high. Twenty-seven of the thirty-one instances (87%) posted a close lower than the trigger price within 4 days.